Here a guide for all people who want to donate fast in nobility! Install the tasker the tasker. (Go to Zath-Co client folder -> 3-NobilityDonate -> WindowsXP -> extract: Zath-Co-Tasker.rar -> open folder Zath-Co-Tasker -> run the install. open the right tasker save: Click "File" -> click "Open" -> search for the downloaded Left.tsk or Righr.tsk! For Left.tsk do the following! Click "Tools" -> click "Advanced Options" -> Change "Fast Playback Factor" to 610 and "Slow Playback Factor" to 210. -> Click "Apply" and "OK"
Now click "Recorder" and it will start! For Right.tsk do the following! 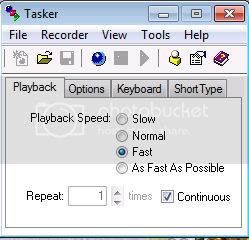 Click "Tools" -> click "Advanced Options" -> Change "Fast Playback Factor" to 420 and "Slow Playback Factor" to 210. -> Click "Apply" and "OK"
Remember: using a tasker is always own risk. It may lock your account! MAKE SURE YOU DOWNLOAD THE .tsk SAVES BELOW THIS!